Recently, after hearing about the health benefits of a gluten free diet my husband decided to try it for a week to see if it would improve how he felt. after a week of eliminating or nearly eliminating gluten from his diet he said most of his aches, pains and fatigue had been alleviated. He also, felt a little discouraged that it was so difficult to find tasty gluten free foods and was concerned about the expense. Well, I took that as a challenge. Healthy does not have to be expensive or difficult. Simple foods should be simple to prepare and simple to obtain. So as I embark on Our Gluten Free or Near Gluten Free journey I will post my discoveries. Flavor does not have to be compromised! Preheat oven to 375 degrees and lightly grease a 9 × 9 baking dish. Put apples and applesauce in a large bowl and toss with lemon juice. Mix in granulated sugar, cornstarch and cinnamon. Transfer to greased baking dish. Combine brown sugar, oat flour, oats, cinnamon and salt and stir. Add room temperature butter and cut with a pastry cutter until crumbly. 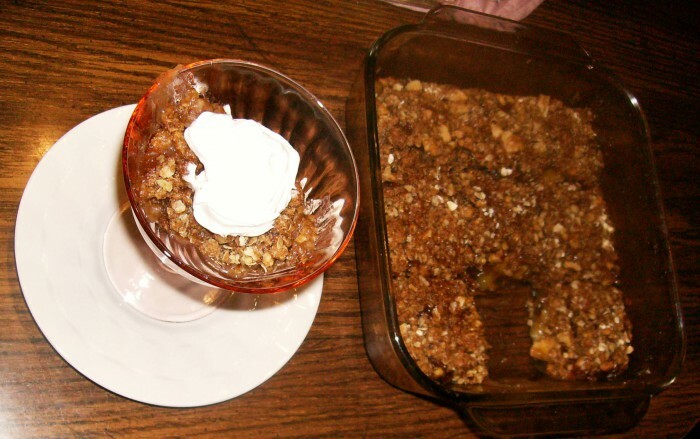 Sprinkle topping over the apples and bake until apples are soft and topping is golden brown, about 45-50 minutes. Let rest 10-15 minutes before serving. Is great with homemade vanilla ice cream.